Buried under the snow, the Tavn Bogd Mountains divide Russia, China and Mongolia. The highest peaks are known as the Five Saints and in the perpetual snow above 12,000 feet are the scattered prints of snow leopards and what some mountaineers think is the mythical Yeti. This is about as far from the globe’s frenzied geopolitics and lifestyles you are ever going to get. The saints form an inspiring bowl towering over Mongolia’s largest glacier The Potanin, a 23 square mile river of ice. For the few fortunate enough to get here it is more than a religious experience, you have entered eco-nirvana. 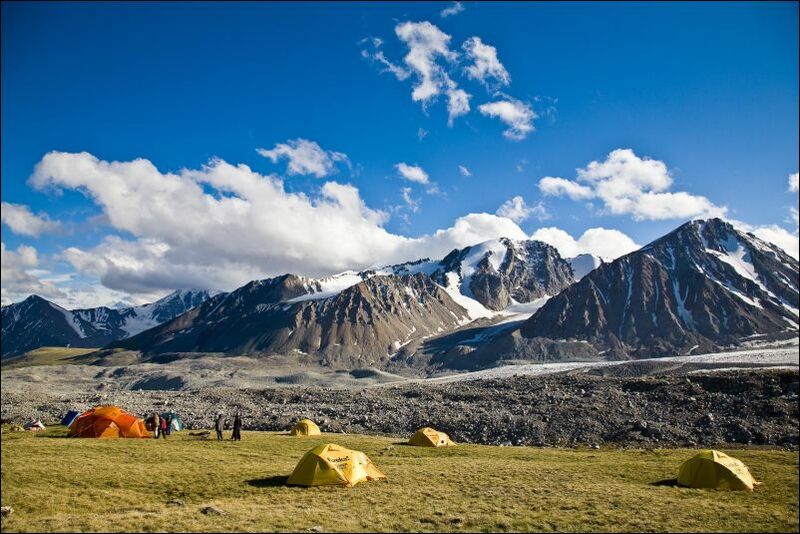 Tusker is one of the few international trekking companies to have penetrated Mongolia’s western fringe where Tavn Bogd National Park throws up a 120 kilometer wall of mountains, the Altai, the highest in Mongolia. They serve as an near impenetrable border as the Tavn Bogd subrange has been frozen in time part because of isolation and long arctic like winters. Only the most skilled mountain climbers have been atop all Five Saints and its ice encased peaks. Mt. Khuiten is the highest at 14,350 feet, but not the most difficult to climb. It is a two day technical hike, mostly up a narrow ridge in ice and snow. The President of Mongolia bagged the summit in 2006 and renamed it Ikh Mongol (The Great Mongol) but when the government changed, the name reverted to Khuiten. Nairamdal or Friendship Peak at 13,392 feet is where the three borders meet and is a tougher climb because of ice crevasses. Perhaps the most challenging peak is Mt. Snow Church. It was first climbed in 1967 by a Polish/Mongolian expedition and the rudimentary map of the Five Saints came from that expedition. That map is still in use as Tavn Bogd remains one of the most unchartered national parks in the world. With a 1,500 foot polished north face called the ice diamond Mt. Snow Church is considered by some mountaineers the most beautiful peak in the world. A British expedition in 1993 recorded 13 first ascents in Tavn Bogd spending 15 hours trying to summit Snow Church, but only came close. In the pursuit they found some very curious prints in the snow. “Then we saw them, a line of unmistakable footprints coming up the glacier for several miles. They passed in front of us, then disappeared over the left of the two cols we had investigated two days before—into China onto the Przhevalski Glacier. “I can’t imagine who, besides ourselves, would want to go there,” quipped Lindsay Griffin, one of the climbers. “Like excited schoolboys, we nearly ran across the glacier to investigate the mysterious footprints,” wrote Edward Webster, the lone American on the summer long expedition. “The prints were approximately eight inches long, slightly curved and primate-looking, showing five toes with evidence of claw or nail marks. They were about two or three inches deep, frozen in the fresh, crisp snow, in excellent condition and less than a day old, we speculated. The odd thing was that they appeared to be made in sets of three: left, right, right, or right, left, left. Had we discovered the world’s first triped, or were we looking at prints left by a primate who walked with one hand on the ground like a chimpanzee? Had we found the footprints of the Almas? It seemed so.” Lindsay Griffin was the team’s best climber nicknamed the “ice machine” and got hit by an 800 pound boulder and had to be helicoptered out with two broken legs. According to Britain’s Scientific Exploration Society, there are more Yeti sightings in Mongolia than in any other part of Asia. Mongolians believe Almas are a primitive human rather than an animal. There are countless stories of Almas falling asleep in Mongolian yurts. On your Tusker trek in Mongolia don’t expect to see a six to eight foot tall Yeti. They remain more myth than scientific fact, but you could see a variety of wildlife from white deer and their many predators wolves, bears and eagles. Ancient rock carvings on stone faces found below the Five Saints illustrate human and animal history through the centuries. These stone gods are found throughout the valleys below snow line creating a veritable outdoor prehistoric sculpture garden. In a 15 kilometer stretch alone there are 10,000 stone petroglyphs on the western side of park. These glyphs earned the park its UNESCO World Heritage status and tell the history of the hunter gathers who took down large animals here 11,000 years ago as well as the more modern pastoralists and nomads who still live here. The trip’s 15 day pace allows for exploring these archaeological sites, and they will create more questions than they answer. Although time and culture separate us, the people who swept through this valley on horseback centuries ago didn’t have the luxury of marveling at the mountain views blocking the valley ahead. They were more focused on staying alive in a frozen world. The question they likely asked—how were they going to surmount Tavn Bogd’s looming peaks ahead? Be thankful you’re less threatened. Use your camera to capture the light emanating off these stone gods and filtering through the Five Saints ahead. This trip is as much about mountains as it is about water. The mountains and glaciers produce copious amounts of it creating three large lakes, several large rivers, too many creeks to count and several major waterfalls spilling out of the high country. On the trek into the park you will camp along these huge lakes and cross the gushing rivers several times. Like the Mongols who came before you, this trip is best navigated on a Mongolian horse or on your own two feet, which keeps you crossing the rivers, soggy alpine meadows and the last great reed beds in Central Asia. Of the world’s ten largest river basins, two have their headwaters here. There are few places on earth that have this much water, this much mountain and as many archaeological sites as the Altai Mountains of Western Mongolia. This is the only Tusker trip where you are offered the choice of hiking or riding a horse. Unlike Tusker trips to Kilimanjaro and Nepal it is not a long trek at high altitude to reach an iconic peak or destination. Instead it’s a cross country trip through river valleys, the homelands of nomadic Kazakh and Tuvan herders who have been largely untouched by 21st century technology. The highest point you will reach is a 10,350 foot mountain pass above the Sheveed Uul Gorge. Tusker was the first to offer this trip in 2007, and it remains one of the most unique adventure travel trips in the world. Outside Magazine named it one of their top ten trips of the year in 2011 with good reason. It is a Tusker hallmark as other firms are put off by the difficult logistics—there are no airports or paved roads into the park. Hotels, restaurants, marked hiking trails, a visitor center inside the park don’t exist and are not in the planning stages. This is among the most remote, unspoiled places left in the world and we hope it stays that way. The Five Saints tower above it and have done so for centuries allowing only the most intrepid to pass. They are the gate keepers and have guarded their sanctuary well.